One of the great things about being retired is that you can take trips whenever you want to. While my daughter was home on spring break this year, we decided to go see Bishop Castle. For those of you who don’t know about Bishop Castle (which is probably most people reading this), here’s an overview at their website. 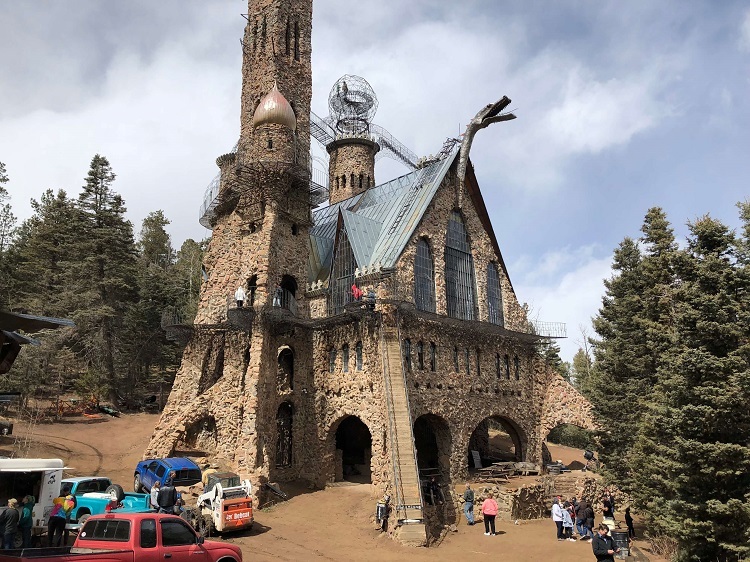 Bishop Castle is an “elaborate and intricate” “one-man project” named after its constructor, Jim Bishop, that has become a roadside attraction in central Colorado. 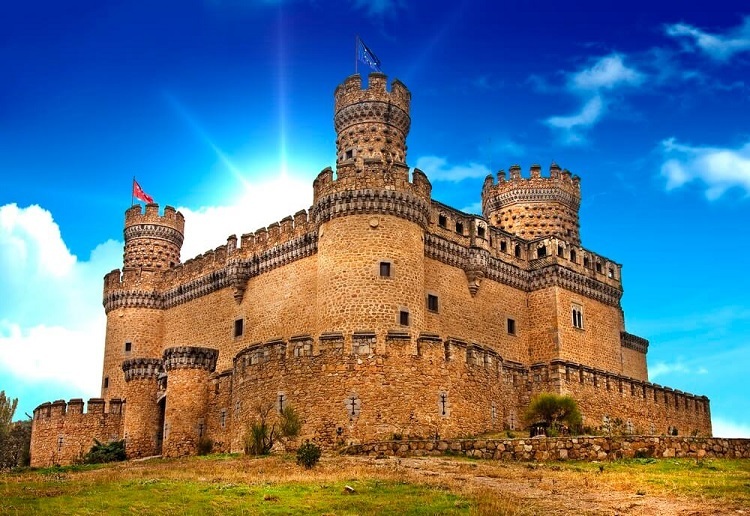 The “castle” is located in south central Colorado on State Highway 165 in the Wet Mountains of Southern Colorado in the San Isabel National Forest, southwest of Pueblo, Colorado. Bishop bought the land for the site for $450 when he was 15, and construction on what was originally intended to be a family project to build a cottage started in 1969. After Bishop surrounded the cottage with rocks, several neighbors noted that the structure looked something like a castle. Bishop took this into consideration and soon began building his castle. 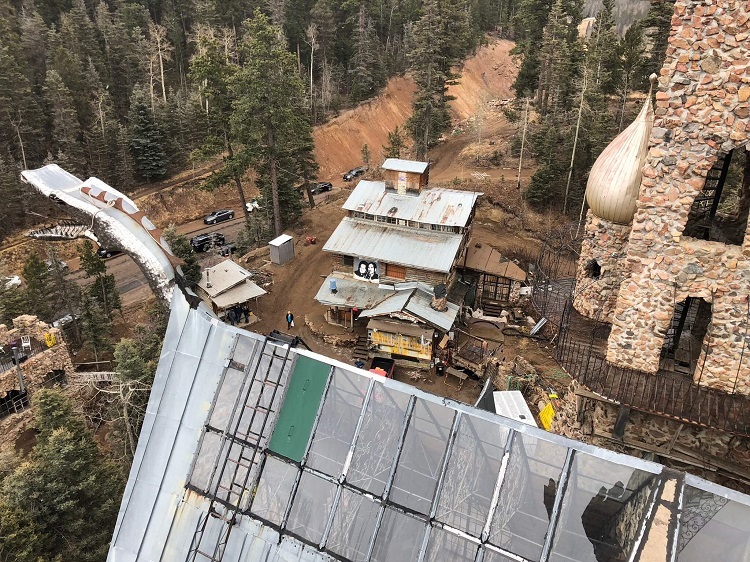 According to Roadsideamerica, “for most” of the 40 years he has worked on the castle “Bishop was engaged in a running battle with Washington bureaucrats over the rocks that he used,” which came from the National Forest surrounding his property. “Bishop felt that they were his for the taking, the government wanted to charge him per truckload.” That dispute has been settled. In 1996, he was challenged by the local and state government over unsanctioned road signs that pointed to the site. They settled the dispute by issuing official road signs. So this guy has been building a castle on his own for 40 years and let’s say is somewhat of a “free spirit”. Sounds like a great place to visit, right? We had heard of Bishop Castle almost immediately upon moving to Colorado but I never really knew where it was. For some reason I thought it was roughly an hour away and east of us. It’s actually almost two hours from us, up in the mountains south and west of us. It was a place all four of us wanted to see so we decided to give it a go. We hopped into the car on a nice and warm (70 degrees) spring day. The wind was blowing up a storm (high wind advisory), the kind that makes driving stressful. Then we turned west toward the castle and started heading up in elevation. Pueblo (south of where we live) is at 4,700 feet elevation while the castle is at around 9,000 feet. By the time we arrived at Bishop Castle, the temperature had dropped to 30 degrees and it was snowing. Yikes! So what can I say about the castle? Let’s begin with a photo from the outside so you have an idea what I’m talking about. Here is Bishop Castle in all its glory! This was taken after the snow ended. Overall, the main part of the castle was sturdy. It felt as solid as — well, a castle. That said, it was certainly not built to any building code specifications. The steps were too narrow and much of the iron work on the outside was shaky. It looked like it was a kid’s project that had come to life over 40 years. It had some nice touches like stained glass panels and huge fireplaces. The dragon’s head also blows out fire on special occasions. Inside one of the main rooms at Bishop Castle. 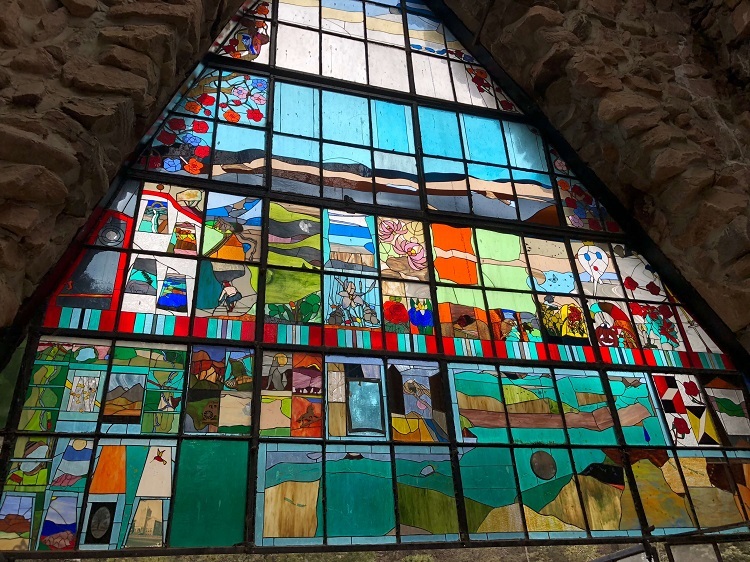 A beautiful stained glass window at the end of one large room. 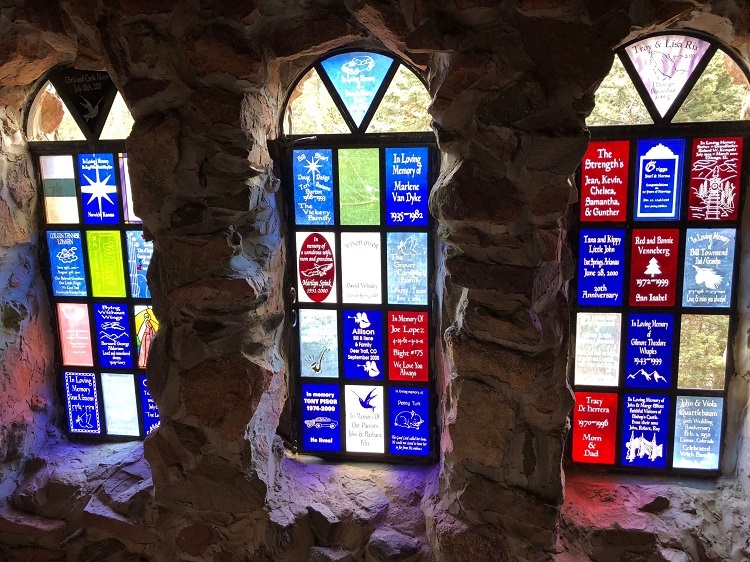 Smaller stained glass windows. Looks like many of these were purchased by families. The area around the castle was dirt/mud, devoid of grass from all the tourists that had trampled on it over the years. When we went to the gift shop we saw a masterplan drawing for the area. After he’s done with the castle the owner wanted to build a wall around the entire property. Yeah, I don’t think he’s going to have time to get to that. It took 40 years for the castle — the wall will take longer. My daughter took this from one of highest (if not the highest) spots in the castle. To the left is the dragon’s head. In the center (on the ground below) is the gift shop. In the background you can get a feel for how remote it was. There’s no cost, but you can make a donation. The area has several rantings from the owner against the government, mostly about free speech and his rights on his land. Not a surprise once you read the summary above. We were there maybe an hour, somehow escaped with our lives (the metal walkways were really shaky), and visited both the castle and the gift shop. On the drive to the castle we had a “discussion” about the fact that we often eat at chain restaurants and not local ones. I’m then met with blank stares. Hey, if someone wants to eat locally, I’m all for it. But I’m not going to hunt down the place as well! Come on, they have to do some of the work. So while I was fighting the wind on the way to the castle, they had done the work (good thing too since we lost cell connection out there in the boonies). The brain-trust of my wife and daughter had identified two options: a diner and a BBQ place, both of which were about 30 minutes from the castle just before we got back on the interstate. My son wanted pancakes, so the diner it was. We stopped at the Rye Cafe and had a very nice lunch. 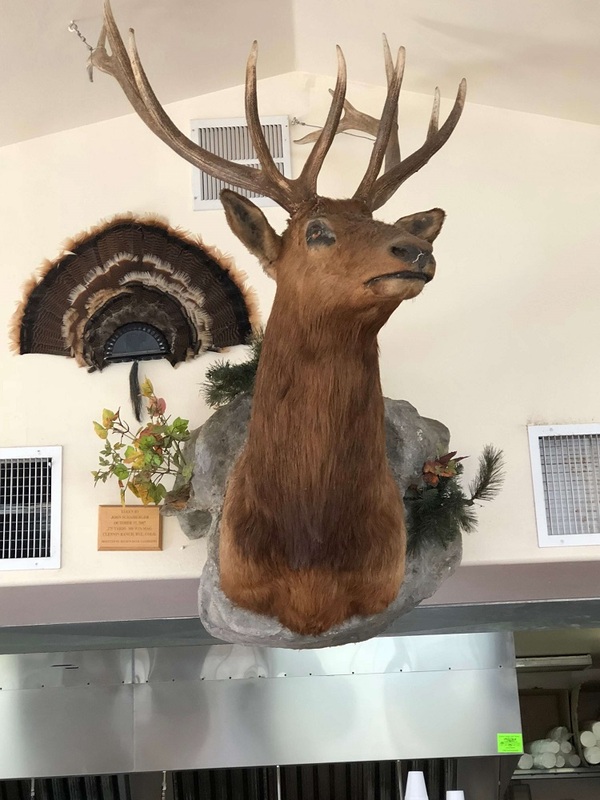 What’s an old cafe without a deer head and turkey feathers on the wall? At the end I took the check and walked up to the cashier. She told me the price and I whipped out my Costco Visa to get 3% cash back. You know those times where the world just seems to stop because something someone has said or done just doesn’t compute with reality? This was one of those times. I was stunned. This conversation just kept getting stranger. She told me that the owner was “kind of old-fashioned” and that’s why he didn’t take credit cards. Yeah, it’s not that. It’s because of the cost of credit cards for the cafe. Because though he was “old-fashioned” he had an ATM in his restaurant, a place that had last been remodeled sometime around the time I was born. Another old-fashioned fixture from the cafe. And then she was going to let me take the check home and send her the money? What? Had I been transported back to Mayberry? 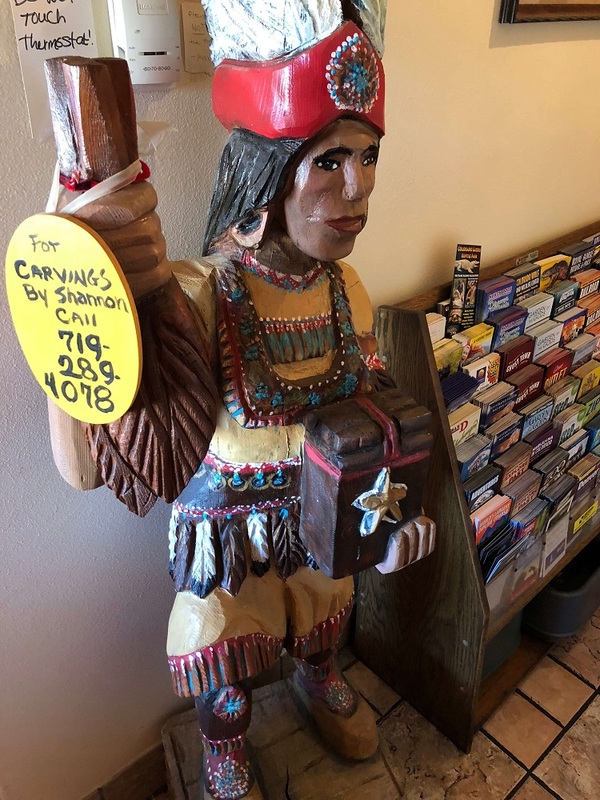 I always carry a good bit of cash anyway, so after I shook off the surprise of finding the one place in America that doesn’t take credit cards, I told her I could pay with cash. I did just that, and we were off. Less than a week after we had visited, I saw a news report on Facebook that the castle’s gift shop had burned down. 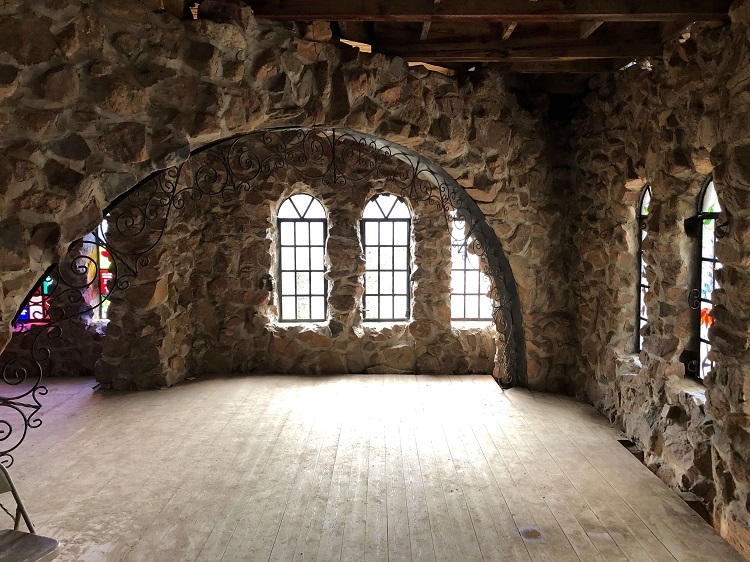 On March 28, 2018, a fire was ignited on the Bishop Castle property, disintegrating the gift shop and a guest house. The fire is speculated to be electrical, and did not damage the castle itself. Despite the fire, the attraction re-opened to the public later that week, while being supported with donations and volunteer labor. The gift shop was a stack of tinder just waiting to go up in flames. The owner had built it with even less attention than the castle and the stove that heated the shack (which is more of what it was than a shop) was putting off such a large amount of heat all around the dry, wood walls that I thought it was going to spontaneously combust when we were there. 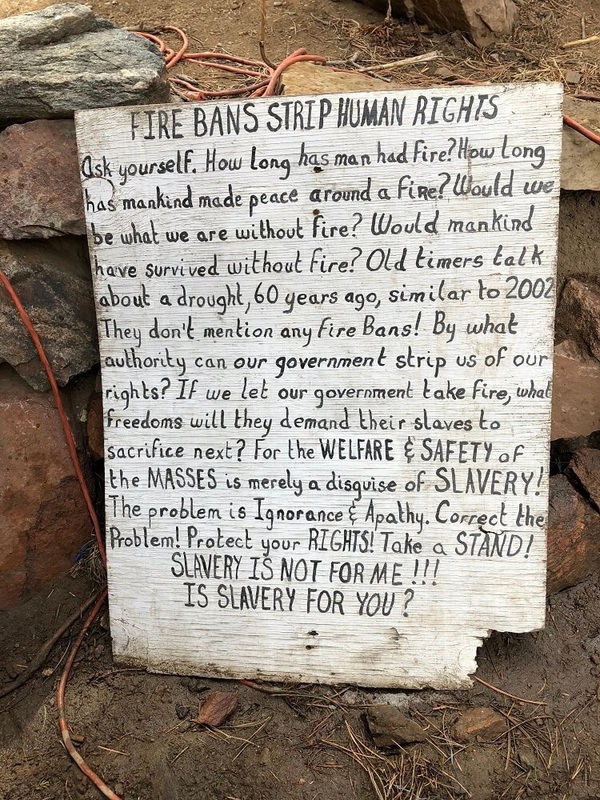 Ironically the owner had posted a big sign on the property ranting about the government trying to enforce “no burn” policies when it was dry. He claimed that fire was a natural right and he could do whatever he wanted on his land. The irony of this sign was felt a week after we visited. Overall it was a fun day and great memories with the family. Boy, I LOVE retirement! Cool, I’ve been to Colorado a bajillion times but never there. Looks like a nice piece of Americana! Unlike Accidental Fire, I’ve never been to Colorado (except to catch a connecting flight). Sounds like an interesting trip! My wife and I just got some chase preferred credit cards to get points on things we buy. I’ve been learning all sorts of things that cannot get paid with credit cards (auto bills, mortgages, etc). Afterwards, this of course makes sense… But I had just never tried. We had one in my home town outside of Franklin, TN and they hosted a Reneissance fair every year. Much better built I suppose then the castle you describe above. You’re darn right the diner owner doesn’t want to pay for credit card handling. Where do you think the 3% cash back comes from? It comes from the merchant. I wouldn’t be surprised if the banks ding him 5% for every credit card transaction. So yeah – cut the little guy a break. The big chains can negotiate better deals and they’ve already jacked up their prices to pay for credit card handling. But whenever I deal with a small or local business, I pay with cash or check. You and I are probably the only people in America who still use checks and I don’t carry my checkbooks with me. Do you? I also don’t carry tons of cash except for emergencies because I haven’t been forced to pay in cash for a decade at least. I carry enough cash to get a meal and a taxi in emergencies. More when I am traveling. Lots more when I travel internationally. I saved the tail end of a VP once in Russia when we got to the airport and the taxi driver refused her credit card saying “Cash only”. I had rubles with me. I recently had a local tradesman replace an irrigation pump. He would take the credit card but preferred cash. We know why he prefers cash. I went into the house and wrote him a check. He’s a good guy and did right by me. I think I would have loved the castle. I like out of the way places that have unique architectural history. Castle in the clouds in mid-state New Hampshire is such a place and would be very similar. Sorry to say that the local Chinese take out 3 blocks away is cash only. I was also taken to a Dim Sum place that was not a hole in the wall diner in LA that was also cash only. Also where my dad lives there is a small Amish bulk store that is cash only for obvious reasons. I have been visiting Bishop’s Castle about every 5 years since I moved to Colorado in 1985. It is a unique place and it has been fun watching it grow. The rickety ironwork scares the hell out of me too, but Jim Bishop made a living as a first rate welder in Pueblo before he retired, so I doubt that any of it will come apart in his lifetime. This place shows what one man with a dream can accomplish when he stays focused on a his goal.